So, this blog world has crept up on me sort of slowly and insidiously and I'm at the point where I can actually say that I'm officially a recreational blogger. Will it ever take over my life? No, I love my job! But... I do sometimes find that there's a whole little blog world that I'm now a part of and my non-bloggy friends don't quite understand. For instance, the blogosphere is powerful and I find that often a great idea is echoed in many different blogs because many of us follow one another or keep in touch in some way. Today's post is self-indulgent in the way having that brownie or extra glass of wine is indulgent... but isn't that just what we need sometimes when the weather has been cold for soooooo long? 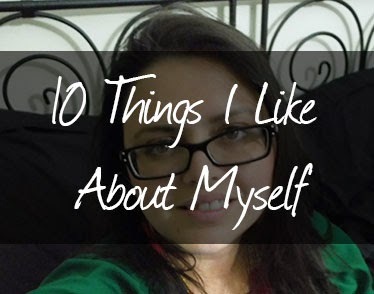 It's also surprisingly difficult to do, but I'm going to follow the example of another brave blogger and tell you all ten things I like about myself. Keep in mind that this is hard because we're all taught to be humble. Yes, we live in a society that applauds humility, but rewards confidence. So why don't we challenge ourselves to be both? I'm ashamed to say that I could probably more easily compile a list of things I need to improve, but isn't that a little sad? I think this will be a great exercise and I challenge you to come up with your own list and share it.. or not. Either way, I think it will be highly liberating. And because I initially felt nervous to choose ten things I like about myself, I'm going to go a step further and choose fifteen! 1. I'm smart. I wish there were a way to say it without being braggy, but I don't care because I am really freakin' smart and it's one of my best qualities. It helped me in school and it helps me at work. I even think it directs me socially because I seek out people who challenge me. 2. I am creative. I have always had a knack for creative endeavours and I like to make things myself. 3. I have a great sense of humour. I've always been a little bit of a clown. I loved making my friends laugh in school. As an adult, this translates to a sarcastic, silly, uncensored sense of humour and I really like it. 4. I'm really good at camping and being in the outdoors. I'm surprisingly resourceful and I do well in quasi-survival situations. I think I could survive a zombie outbreak. 5. I choose friends (and significant others) well. This may not feel like a skill, but I'm exceptionally proud of the friends I keep. 6. I care. I care about people, animals, causes... you name it. I am really committed to leaving the world a better place than when I found it and I genuinely want the people around me to feel loved and special. 8. I am a natural leader and I manage to take charge even when I'm feeling shy. 9. I don't have any grey hair... Isn't that amazing??? 10. I am a natural motivator and giver of great advice. Ask my family and close friends! 11. I am an achiever. This list is a perfect example... I felt like I couldn't do it, so I pushed myself to do 50% more. 12. I have never read 50 Shades of Grey... I am inexplicably proud of this fact. 13. I cook. Maybe too well at times, but Corey and I think I'm a fabulous cook... with the one exception being an almond and mustered encrusted chicken dish, which we never speak of. 14. I am brave enough to speak in public even when I'm nervous... and to have taken an unedited selfie for this post after working a 15 hour day! 15. I am fun! I love games and laughs and all sorts of antics. I feel like Corey and I will have a fun life!